What Will They Remember After Your Hospitality Event? "We bring you back every year because they ask for you..."
Human brains are not wired for complicated ideas; in fact, our minds naturally reject them in favor of very simple ideas all the time. We want things that are easy to understand and direct. My mentors taught me that every great magic trick can be summed up in one simple sentence: two oranges appears under a cup; or, a coin penetrates the wall of a bottle; or I tell you what card you are thinking of. It works for two reasons. First, the mind easily grasps what happened (even if they don’t understand “how”). Second, your guests can easily tell someone else what happened: “I was holding the bottle, and he knocked the coin right through the glass.” The easier it is for someone to explain their experience to someone else, the more likely they are to remember it. We have experiences like that all the time. Our minds process so much information through our senses that most of it passes through unprocessed. Like wallpaper, most of the things we encounter aren’t important enough for us to focus on them, so they fade into the background. Unexpected things do not. Things that go against our natural understanding and assumptions stick out in our minds because they do not fit the rest of our world view. Our minds seem to be regularly processing and reprocessing these ideas in an effort to make them fit - and that makes those ideas memorable. As a magician, “unexpected” is my forte. My show is full of surprises - both things that suddenly happen without warning, but also things that the audience doesn’t believe can happen are also unexpected and surprising. I can slowly remove just the frame of a small coin purse from my pocket, show both sides, and open it, and then remove a large Sharpie marker. It happens slowly, but it’s so incongruent it’s surprising. The red ball was “expected.” Given that there was a cup, and given that I was a magician, the small red ball appearing and disappearing under the cup was fairly predictable. The oranges, however, appeared from nowhere and were a complete surprise, so they stuck out in his mind (you can see a performance video here). Just as simple things are easy to retell, concrete ideas are easy to imagine and understand. A Futurist speaker might describe a future where everything is done by machine, and we don’t have to lift a finger at any point in our day. A memorable futurist speaker might describe a robot butler - how it looks, the tasks it performs each day, how people communicate with it, how it charges, etc. Ideas that are fleshed out and concrete are easier to remember because they have more meaningful details. Few entertainment options are as concrete as magic. In another classic magic piece, a performer knocks a coin into a bottle. All the senses are engaged in the experience. The audience can touch and examine the coin and the bottle. They can see the items, but they can also hear the magician’s voice and the sound of the coin clinking against the glass. They can smell the beverage that’s been poured out of the bottle. They can relate to all of these items: they know what coins, bottles, and liquids are. The concrete nature of the objects makes the experience clear in the mind, which makes it much easier to remember. We remember things that come from people of great authority. If a believable expert tells us something is true, we can quickly assimilate that information into our worldview and go forward. It’s easy to remember because it fits with the other things we believe (and as cognitive dissonance teaches us, it supports the other things we believe). Can entertainment be credible? Can a field that’s apparently known for creating fantasies, using set design, special effects, and make-up develop credibility with the audience? Absolutely. The memory people take away from a phenomenal piece of magic isn’t related to the magician’s credibility or his own air of authority. The credibility lies in the experience itself. The audience examines the objects and pronounces them legitimate. Then, they experience the moment of magic themselves. It happened to them. They have the memory, and when they relive the memory, they are themselves the storyteller. It’s really difficult to not believe yourself. (Note: A client actually pointed this out to me in New Orleans for the SSPC Show. Over dinner I mentioned the Heath Brothers book and how magic managed to hit five of the six but not “credibility.” She immediately disagreed and gave me the notes above). We invest emotion in important things, and those emotions make those things memorable. Think back to an important moment in your life or a cherished memory. Not only will you be able to remember the sensory experience of being there, you can also remember the emotions that surrounded that moment: pride, anger, fear, frustration, success, overcoming obstacles, joy, or loss. The emotions give the moment meaning which adds to the memory. Emotion is the critical component in entertainment. If a performer is being ignored - whether he’s a comedian bombing on stage or a guitar player strumming away in the corner of a restaurant - he’s being ignored because the audience isn’t emotionally engaged in what he’s doing. The words and music have to connect with the audience, so they feel the emotion, too. Tommy Wonder, the great Dutch master magician, once said, “But emotion isn’t very interesting unless it’s changing… so conflict is very important.” Great entertainment is full of conflict and emotion. In magic, the conflict between man and the natural laws of physics is an obvious constant - how does the orange appear under the cup? Or how does the coin penetrate the glass without breaking it? And of course, there’s all the emotions that come up when we see something impossible happen: laughter and surprise, shock and awe, sometimes even a little bit of fear. How does the magician know what I’m thinking? What else does he know about me? Great entertainment is packed with emotions, and that’s what makes it so memorable. There’s a natural flow to things we remember. An event should have a story - maybe a literal “meaningful” background piece, but a natural flow of “first we did this, then we did that, and for the big finale we…”. We remember things that we can retell, too. When things fit together into a natural sequence they’re easier to remember. Great speakers do this: at first I was this kind of person, then I learned this fact/skill/experience, and now I am this kind of person. Great magic has a beginning, a middle, and an end. There’s the initial situation - the coin and the bottle are separate - followed by the impossible moment - the coin is inside the bottle - and finally the finish - the coin is outside of the bottle. It’s easy to retell. 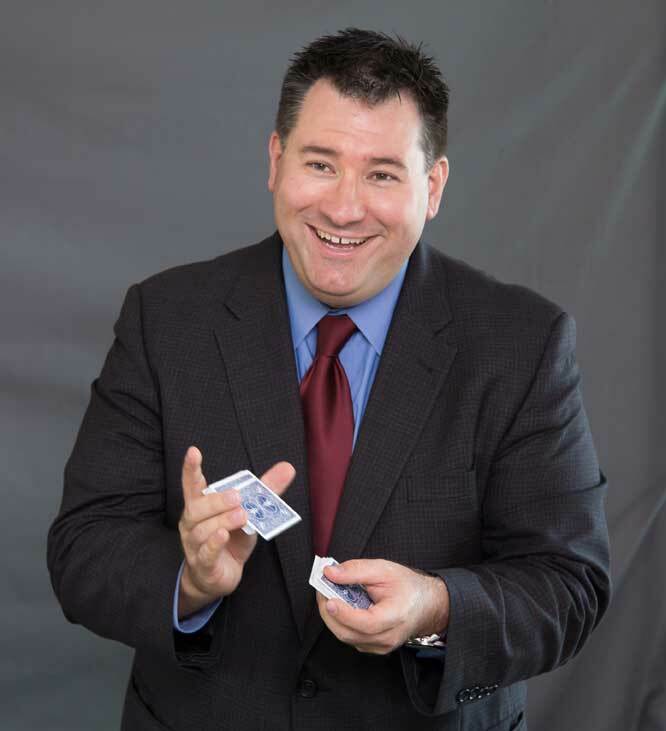 Unlike any other form of entertainment, magic brings the audience into the story as well. They can apparently affect the flow of the trick and what happens next - “But then Bob wanted to shuffle the cards, but the magician still dealt out the royal flush!” The audience is actually part of the story - their emotions and comments affect the direction the performance takes, and the “improvised” moments that surround the audience’s behavior are all a part of the story the audience will tell long after the show ends. Memory is a critical component any event. If we want people to talk about our event or look forward to attending the next occasion, our guests have to remember the event first. It’s critical that everything we bring to the event must have some component that makes it memorable to the audience. In the next post, we’ll take it a step deeper and show how we can affect what the audience remembers from your event - the entertainment itself, or even a sponsor’s name or business message. Michael Duseberg creates events guests give rave reviews, remember forever, and look forward to repeating. He's entertained for companies including Emerson Electric, Kaman Industrial Technologies, and UBS, as well as some of the most exclusive golf clubs in the world.